The second serial from Jon Pertwee’s second season as the Third Doctor, “The Mind Of Evil” survived for years only as a black-and-white copy of the original color transmission. Thanks to digital reconstruction, the newly released DVD returns all six episodes to color, all the better for anyone wanting to revel in the deep burgundy of the Doctor’s velvet smoking jacket. Season eight found Doctor Who settling into a groove after the radical readjustment of the previous year, when the newly regenerated Doctor was exiled on Earth and took a job helping Brigadier Alastair Gordon Lethbridge-Stewart and his quasi-military alien-invasion taskforce, UNIT. Although Doctor Who was still very much a show about an eccentric scientific genius battling outer-space monsters, eliminating his ability to zip across the universe changed the format of the series—limiting its options in certain obvious ways, but also opening up the possibilities for more topical and politically aware stories, more elaborate stuntwork, and a larger cast of recurring characters. All this helped shift early-1970s Doctor Who even further toward redefining itself as a blend of science fiction and spy-thriller a la The Avengers, Mission: Impossible, and the James Bond films. “The Mind Of Evil” is a classic example, dealing with espionage and skullduggery at an international peace conference in one branch of the story, and in the other, a Clockwork Orange-style criminal-rehab-through-brainwashing experiment that quickly turns into something even more horrifying. 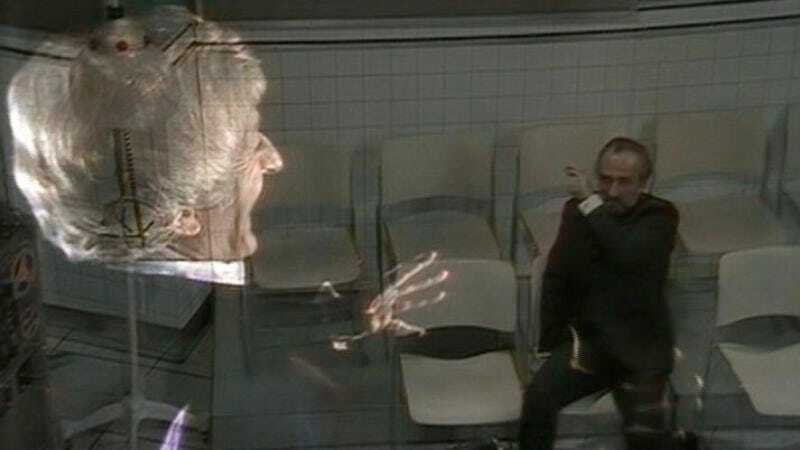 Connecting the two plots is season eight’s most important new recurring character—the Master, a fellow Time Lord rogue played with panache by Roger Delgado, who will become the Doctor’s chief nemesis for all of season eight and much of the next couple of years as well. “Mind Of Evil” feints at topical relevance, but mostly what it wants to be is a bang-up action thriller, at which it succeeds quite well. There’s a concerted effort here to avoid playing this as campy or silly, even despite the inherently flamboyant Doctor and Master as lead hero and villain. The Master’s rubber-mask disguises, for instance, may remind you of Scooby Doo, but they’re also the sort of techno-trickery you’d expect from a Bond or Mission: Impossible villain. As “Mind Of Evil” begins, about six months have passed since the Master’s debut in “Terror Of The Autons,” which ended with the Doctor marooning the Master on Earth just as he himself had been. Though the Master got away, it was obvious he’d be back—for one thing, the Doctor stole a crucial circuit from the Master’s TARDIS without which he’d never get off-planet, but more importantly, the game between the two of them wasn’t done. The Doctor’s grin as he says this line helped establish a basic part of his relationship with the Master that’s stayed the same, for the most part, from 1971 to the present: No matter how much they might genuinely hate each other, they both see their conflict on some level as a game they play together, where there’s also room for mutual respect and even a warped kind of friendship. So for both practical and personal reasons, a new scheme for revenge was certain. And the scheme is a real doozy. Ridiculously complicated and ambitious, it’s essentially three distinct smaller schemes, all pretty ambitious in their own right, linked together. First, posing as the Swiss scientist Emile Keller, the Master’s invented an aggression-reducing machine that secretly doubles as a weapon, allowing him to attack his victims with their own greatest fears. (It’s important to note he’s actually lying about having “invented” the Keller Machine, but we’ll deal with what it really is in a few paragraphs.) He also takes over Stangmoor Prison for use as a base, which gets him all the henchmen he needs once he unlocks their cells. Using his hypnotic powers, the Master has also suborned a Chinese delegate to the peace conference, Chin Lee, and uses her to ratchet up tensions between America and China, the better to make everyone’s trigger fingers itchy. And lastly, he plans to hijack a nuclear missile tipped with nerve gas (which is supposed to make it extra-deadly, though in practice I think the equivalent would be enhancing a grenade by wrapping it in a piece of paper with the word BANG scrawled on it). Our heroes, of course, have no idea at first that all this is connected—to the extent that the Doctor actually gets into a physical altercation with UNIT’s Mike Yates when he’s asked to drop his investigation of the Keller Machine and help look into the problems at the peace conference. This has its roots in the story structure itself, since writer Don Houghton added the China subplot only after he decided he didn’t have enough to fill six episodes. And to some extent, “The Mind Of Evil” functions as two separate Doctor Who serials that have been spliced together—the most interesting issues raised by the prisoner-brainwashing subplot have hardly anything to do with the political-thriller subplot and vice versa. That’s partly because by the time the plot threads intertwine, “The Mind Of Evil” has largely abandoned exploring ideas in favor of cranking up the action. This is most obvious in the prison subplot, which begins with the Doctor showing up at a demonstration of the Keller Machine with the express purpose of loudly proclaiming his moral objections to it. Obnoxious and deliberately confrontational though that is, he’s got a point, and would have even if the Master wasn’t secretly behind the device. Not coincidentally, it’s the same one raised by A Clockwork Orange: If society could remove the aggressive impulses of criminals by altering their brains against their will, would it actually be ethical to do it? That’s certainly where the first episode seems to be directing the story: When the machine malfunctions (or more accurately, misbehaves) and fries the brain of a prisoner named Barnham, then kills one of its own scientists, the Doctor seizes the opportunity to try to prove that “interfering with the mind” is inherently wrong. Turned placid by the device, Barnham floats through the next five episodes like a lost puppy, harmless and pitiable, yet still unnerving and even creepy because there’s an inescapable sense that removing his evil didn’t leave behind a good man, but a broken man. As one scientist, Dr. Summers, suggests, he’s now either “an idiot or a saint”—but how could he be “good” if he can no longer even be tempted to choose evil? But the question of whether or not the Keller process is evil is more or less ignored once it’s revealed that the Keller Machine is evil—to be precise, that inside it is a telepathic parasite that feeds on the fears it causes in its victims. This leads to some of the best moments in “Mind Of Evil,” including the one pictured at the top of this page when the Master meets his own ruffle-shirted bogeyman. Still, it does let the original dilemma get away unanswered, which is a shame. Putting that aside: For all that it’s a three-foot-tall inexpressive device that looks like the world’s most evil coffeemaker, I found myself wanting to see more of the Keller Machine. Particularly after it spontaneously learns how to teleport and runs amok through the prison, which gives the story a powerful jolt of surreality and weird terror. What is the Keller Machine, exactly? We don’t get much back story for how the Master found it, where it came from, or whether it has any motivation beyond feeding itself, but there are a few clues to piece together. The Master seems to think it’s intelligent and not just the random force of destruction we see later, considering that he calls it an “ally,” and it clearly has a will of its own. The Doctor also suggests the living thing inside the machine is the key element to its danger—dismantling the equipment that houses it is not enough to nullify the parasite, which requires a nuclear strike to kill. (A piece of information that helps justify the Doctor’s overblown warning that it’s “the deadliest threat to mankind since the beginning of time.”) So if its metal case isn’t a life-support unit for the parasite, then it’s probably something built by the Master as a way to direct its voracious appetite where he wants it to go—and only there. Which is doomed to fail, since neither he nor anybody else is truly able to control the parasite. The Master’s use of the Keller Machine to turn killers into lambs is apparently made possible by ruthlessly controlling the mind parasite’s innate bloodthirstiness. Whenever it breaks through the Master’s control and feeds on its own, it kills every victim it can. It’s no wonder that the Keller Machine seems to thrive inside a prison, since that’s what the Master has built for it to live in. And that prison, interestingly, is just a little reminiscent of a Dalek shell. Pure speculation on my part, but maybe the parasite itself is some kind of powerfully mutated Dalek. Which makes sense considering how easily it puts two Time Lords under its spell of terror. It’s not so far-fetched, maybe: The parasite is an unremittingly hateful one-eyed blob encased in a metal shell designed to protect others from its malevolence. That’s a nastier, more aggressive twist on the basic design of the Daleks: unremittingly hateful mutant blobs encased in metal shells designed to protect them from others. 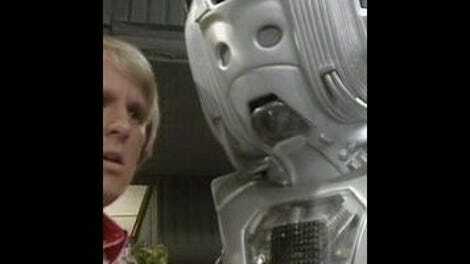 The sheer uncontrollability of the mind parasite leads to one of the weirder aspects of the Master’s scheme: He’s luring the Doctor to Stangmoor Prison not so that the machine can kill him, but so that the Doctor can keep the parasite in check while the Master goes about his other business. That’s like robbing someone at gunpoint, then asking the person to hold your pistol so you can finish going through their wallet. Does Goldfinger expect Bond to help him knock over Fort Knox? Does Moriarty ask Holmes to help him steal the crown jewels? Clearly the Master hasn’t thought this through very well—he’s winging it and is only a couple steps ahead of disaster. But it’s consistent—in later stories like “The Deadly Assassin” and “Last Of The Time Lords,” the Master is markedly better at the whole convoluted-scheme thing, but in these earlier seasons, he’s often his own worst enemy, making plans that are doomed from the beginning. The mind parasite is just one of a host of alien bad guys—Autons, Axons, Daleks, etc.—who ally with him, then wind up trying to kill him anyway. Often, the Doctor’s intervention is the only reason he survives his own schemes. The Master’s ultimate aim in “Mind Of Evil,” he claims, is to take over whatever remains of the human race after the nuclear war he plans to unleash. I don’t really buy that—despite his name, the Master doesn’t seem like someone who’d actually want to rule the world. He carries himself like he’s lawful evil but acts like he’s chaotic evil: Keeping order is so much more tedious than upsetting order. No, what he really wants is simply to confront the Doctor again, which was the reason he came to Earth in “Terror Of The Autons” in the first place—it’s a personal vendetta that he selfishly enjoys dragging everyone else into. This gives their deadly rivalry a strange little undercurrent of play—like they’re kids pretending to be Time Lords who actually get to be Time Lords while they’re playing. Certainly the Doctor’s suggestion to “leave Earth, stop bothering us, go somewhere else and be a nuisance elsewhere” sounds a lot like someone trying to push away a pesky younger brother. The Doctor’s behavior in general, of course, often seems emotionally stuck at around age 17—he may be hundreds of years old, but in some important respects the Third Doctor is very much a disgruntled, know-it-all teen who lashes out at authority every chance he gets. Irritability is a common enough trait among the other Doctors too, but it’s a special case with this one, who was literally born with that chip on his shoulder when the Time Lords forcibly regenerated him and grounded him on Earth. He feels the sting of his powerlessness and the lack of control over his own life, so he compensates by being arrogant and snappish, sometimes when the situation doesn’t really call for it. But it’s also a sign of the times. This is 1971, after all. Just as the style of Patrick Troughton’s Second Doctor mixed an old-school “Victorian gentleman scientist” motif with a more fashionable late-1960s hippie-vagabond vibe, the Third Doctor picks up on the more confrontational side of the counterculture that was starting to crest in the 1970s. The dichotomy that’s created is striking—he’s a strange blend of aristocratic arrogance and disenfranchised outsider’s resentment and contempt for privilege, of cranky old man and brash young turk. He’s simultaneously a symbol of both the counterculture and the Establishment, wanting respect as a high-status Time Lord, but also wanting to pull down the old order. That’s not to say he’s unlikeable—indeed, one of Pertwee’s greatest accomplishments in “Mind Of Evil,” and more broadly through his first couple of seasons, is that the Doctor is still very much the charismatic hero despite his frequent outbursts of foul temper. He gets a lot of help from his co-stars, particularly Katy Manning’s sympathetic Jo Grant, but the various UNIT soldiers, particularly the Brigadier, tend to meet his carping with a smile, though it’s often a sly, hidden one. Jon Pertwee’s acting choices have a lot to do with this too, because a lot of the Doctor’s most obnoxious lines are, as scripted, clearly meant to be jokes or at least tension defusers. Look at the way he greets the Brigadier, who’s just shown up to save his life, at the start of episode six: Not gratitude, but a curt “Do you think for once in your life you could arrive before the nick of time?” This could easily have been a funny, disarming, camaraderie-affirming line if Pertwee had said it ironically, with a sigh of relief, but instead goes for what looks like genuine irritation, making the Doctor look like a bit of an ungrateful hag. The Brig, of course, responds the only way he can: “Glad to see you too,” with a hint of a grin to show he means it. • Sorry for having to push this review forward from last week—twice now, thunderstorms have knocked out power at Casa De Bahn at the wrong time and helped delay me from posting here. I have apparently angered Thor. • A brief look at the secondary cast: In her second Doctor Who appearance, Jo Grant is kept on the sidelines more than she was in “Terror Of The Autons.” She’s still showing a little bit of the Emma Peel vibe that was her original character brief, ending a hostage situation by overpowering a much bigger, armed inmate and coolly quipping “he’s all yours” afterward. But besides that scene, she’s more the gentler Jo she’ll be written as for the next three years—a more stereotypically female role, but perhaps an necessary swerve given that the rest of the cast is so testosterone-heavy. A big part of Jo’s value here is simply helping to draw out the Doctor’s more sympathetic side, which Jon Pertwee keeps hidden under a cloak of snappishness with all the other characters. The UNIT guys also get a bigger day in the sun, which is a mixed blessing: It’s always good to see Nicholas Courtney get more screen time as the Brigadier, whether he’s playing the long-suffering boss with Pertwee or showing a surprising facility for disguising himself as a working-class van driver. Richard Franklin’s pleasant but pointless Mike Yates, though, is an active drag on the story—eating up screen time by getting captured and escaping merely so that he can tell the others where the Master is. And the reason why the Master has left his easily defensible prison-fortress is, basically, because he needs to be hidden so that Mike Yates has something to do. • During a fit of high dudgeon against Keller Machine operator Professor Kettering, the Doctor nearly lets his mouth run away from him: “If I were a scientist? Let me assure you, sir, that I am a scientist! And I have been for several thousand …” And then he catches himself, gets an embarrased look, and storms off. Clearly he was about to say he’s thousands of years old—far older than he’s ever claimed to be at any other point in the series. Continuity plot hole best ignored? Or does this open up the question of whether he’s been lying about his age all those other times? • I wonder if Stangmoor Prison should have had a more gothic, atmospherically creepy design—it’s built out of the ruins of a medieval fortress, after all, and Jo observes in the very first line that it looks like Dracula’s castle. • Pik-Sen Lim, who plays the Master’s unwillingly hypnotized assistant Captain Chin Lee, was the wife of writer Don Houghton, and in fact suggested the China/U.S.-tension-at-the-peace-conference subplot to him. • Dr. Summers is played by Michael Sheard, veteran of six Doctor Who serials including “Castrovalva,” and The Empire Strikes Back’s ill-fated Admiral Ozzel. • Aug. 31: The Third Doctor is trapped in a fascistic alternate universe that’s about to die by fire in 1970’s “Inferno.” And he’s out of marshmallows!